How many times have you come home from work, kicked off your shoes, fell into the couch, and rested your legs up on the coffee table? There are just some days where your feet, ankles, and calves ache. I know that I have been there, and often find myself trying to soothe my pain by rubbing my calves or the bottom of my feet. Sometimes it works, but often it doesn’t. At least, it helps with my flexibility. Taking care of your feet and calves is important. Especially in a world when we are on our feet so often. The fact is, we are built to be on our feet often, but we often do not take care of our feet and lower legs as we should. When we go for a run or bike ride, we’ll stretch after or have a massage. When we are standing or walking, we tend to forget that we are exercising the muscles down there, especially those calf muscles. 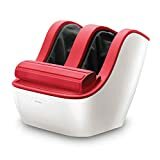 Let me explain why calf massage may be the best treatment and tell you more about the best calf and foot massagers on the market. Can I have a calf massage if I’m pregnant? When should I not massage my calves? I love to wear high heels, and I love to run (just not at the same time). Both activities take their toll on my calves. I can often feel the tightness in my calves but will overlook it when it is combined with other pain. If my feet are killing me or my Achilles or hamstring is acting up, then I find myself concentrating on those areas instead of my calves. I recently discovered how much of an impact calf care could have. I found myself reading up about plantar fasciitis and leg cramps and worried that I was not taking care of myself so I turned to calf massage. We have already talked about the benefits of foot massage, but what are the benefits of calf massage? Flexibility is key for your muscles. If you find it hard or uncomfortable to move your muscle, then you are going to get yourself into a lot of trouble if you continue down that path. Your calf muscles can become tight when you put your muscles into awkward positions (such as wearing high heels) and push your muscles (go for a run). A massage will increase the flexibility of your calf muscles, and get rid of calf and foot pain. Massage also improves the circulation of blood in your muscles. This is not only great for your entire body but will help with the flexibility of your muscles as well as the repair of your muscles. Improved circulation also works wonders for your skin. If you have had any kind of massage before, then you know how relaxing they can be. The same is true for a calf massage. Not only will a massage relieve the stress and tension in your muscles, but it will also help to release the endorphins which will help to relieve the stress and tension in your mind. A calf massage brings all of those things together to relieve you from the pain and stress of strenuous exercise and everyday life. Calf massage can help you work towards a greater sense of well being. We use home massagers to replace the real-life masseurs which we do not have the time or money to visit. The patented figure-8 technology in this massager comes as close to feeling like a real massage as is possible. As soon as you switch the massager on (and we recommend closing your eyes to get the full experience), you will feel as if you are in a massage parlor. This is definitely a massager which gets your blood flowing. The underfoot massage also utilizes reflexology to give you a massage which is almost a spa treatment instead of a home massage. The entire machine is designed to give you comfort, from the floor protectors which keep the massager in place to the enhanced angle which has been designed to match the ergonomics of the man body. This massager will take away all of your stress. This calf massager uses heat to get into your muscles and boost your circulation. Stimulated blood flow means healthier muscles and a healthier body. The massager also uses rolling ball massagers to combining a high-pressure massage with the heat. The result is stress-free muscles and a release of tension. We like how adjustable this massager is. We have been primarily using it to massage out calves, but with a simple adjustment, the massager is perfectly suited for your feet too. A unique selling point is the use of pressure points. The massager is designed to specifically target pressure points in your feet to relieve tension and stress. This is another massager which is perfect for your calves but will also give your feet an expert massage. 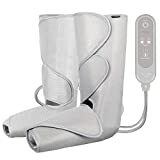 The air-compression massage system, coupled with the air bags inside, relieve fatigue, swelling, pain, and aches from your calves while boosting your circulation and overall health. If you have any swelling, then this massager is particularly great at treating it. We like that you can customize your massage. There are two separate massage modes, with three intensity levels. The controls are also handheld so you can change the settings mid-massage if you wish. There is also a shut-off feature should you fall asleep while using the massager (I’ve been there). This is the best leg massager if you want your massage to go. The portability and storage bag means that you can take this massager anywhere you like. 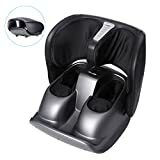 This massager starts as a calf massager, but with one quick fold, you can convert it into a foot massager. We love the shiatsu treatment which you get from this massager. The rolling and tapping movements, when combined with the air-compression system, means that you get a relief like no other. You can start at the bottom of your feet and use this massager to work all the way up your legs, for a half-body massage. The massager also benefits from heat to boost your circulation, improve your well being, and add a healthy glow to your skin. This calf and foot massager uses 3D technology to massage your calves and feet at the same time. The shiatsu massage techniques are combined with acupressure, reflexology, and compression to stimulate and alleviate sore muscles. The heat and pressure also help to stimulate the blood flow within the muscles. The massage will also help to tone your calf muscles. This is a great massager for relieving swollen or fatigued calf muscles. You also have complete control over your calf massage. There are four height options which means you can choose to massage only part of your calf or ensure that the massage does not run up your leg, past your calf. There are also four intensity levels. Great for relaxing after a hard day on your feet. The cost is more than other massagers. The figure-8 technology gives the most realistic massage you can get from a home massager. The shiatsu massage also helps to get the blood flowing, contributing to your overall health and well being. The Fit King is completely customizable to your needs and will relieve you of all your stress and tension. It is also completely portable. For the money, you will not find a better massager. Calf muscles often swell up during pregnancy and massage is one of the few ways in which you can deal with this. We would recommend waiting until you are past your first trimester before you start massaging your calves. We also recommend checking with your doctor before you attempt any kind of massage while you are pregnant. If ever you have a blood clot or suspect that you have a blood clot, then you should stay away from any kind of massage. A history of blood clots is fine, but we still recommend getting checked and given the all clear before proceeding with a massage. If you have an injury, then you should consult with a medical professional before you massage the area. 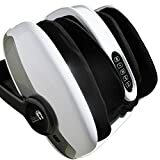 Most of the modern home massagers have advanced so much that they are almost as good as a professional massage, and with some of them, it is hard to tell the difference. Calf massagers really will take away your aches and pains, as well as getting rid of calf and foot swelling. They also take away the stress connected to regular life as well as the stress you get when you have to pay for a professional massage. Massage costs can soon add up, but with a home massager, you can have a professional massage, whenever you want and wherever you want. A home massager pays for itself and gives you a better life.